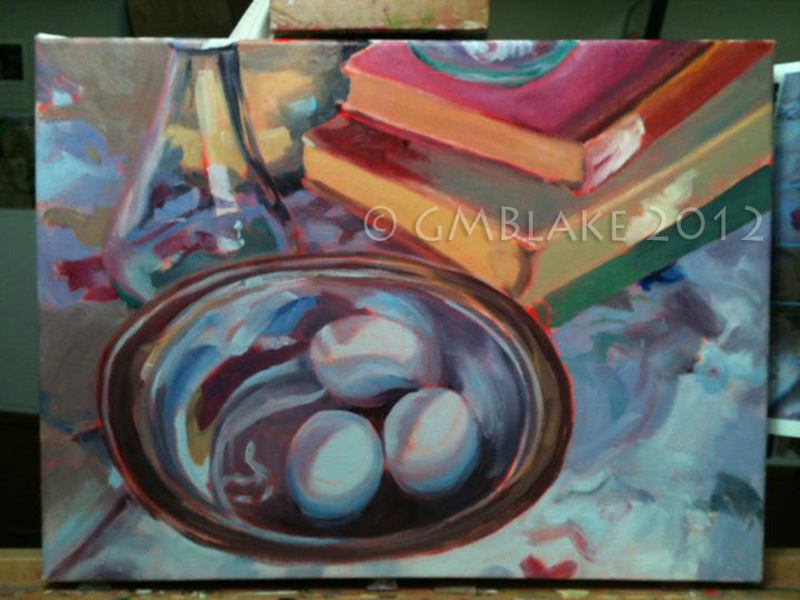 Back in September 2011 (according to the dates on the photos I took) I started what was to be the first of a series of blue egg still lifes. My husband was bringing home these eggs from the Binghamton farmers’ market last year, and they are beautiful — the softest of blues ranging from aqua tint to a pale sky blue, natural to the breed of chicken that lays them. 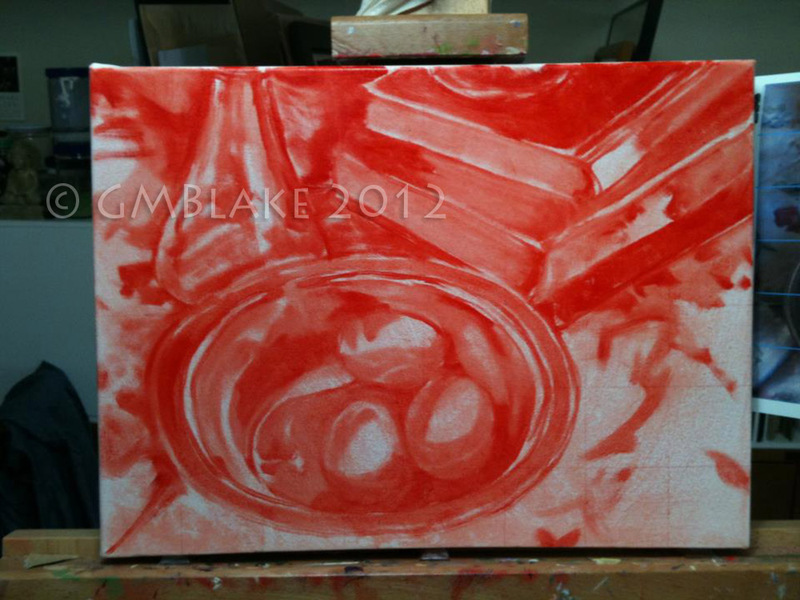 So I set up and photographed some arrangements of the eggs in natural light — after saving them in the fridge for at least a week, maybe more, thinking of a “live” still life — prepared three smallish 12 x 16″ canvases with an acrylic wash of cadmium red, and chose and cropped three of the photos, experimenting with various color saturation settings but otherwise leaving the photos unedited. As usual, I printed out versions with overlaid grids and without. I like “gridding up” as a means of transferring compositions to final substrate, as it gives my hand freedom for happy accidents and surprises, but helps me retain basic proportions and layout. 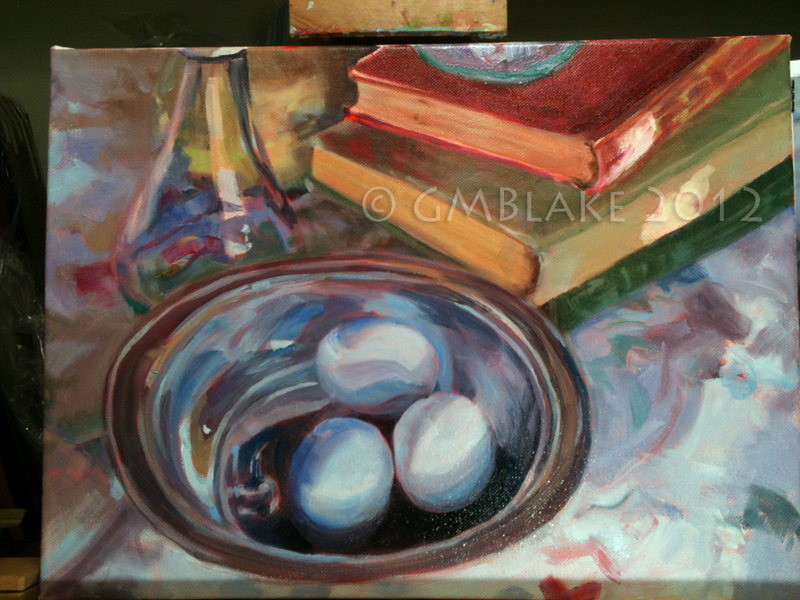 Blue Eggs, Silver Bowl - stage 3: the white speckles at center bottom are light relections, from a still-wet blue glaze I applied over eggs and bowl.